I promise this will be the last post on my new office space for a while! 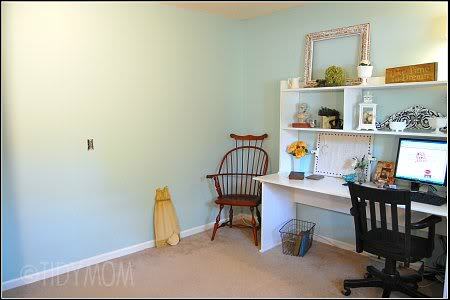 Earlier this week I showed you how I finished painting my new office and my desks. 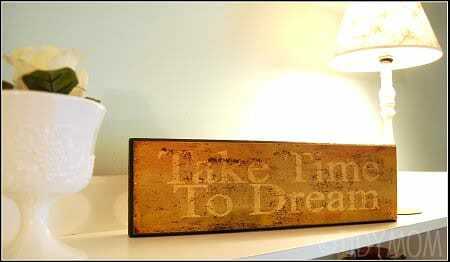 I had fun decorating one desk with some of the goodies have have bought for the room. 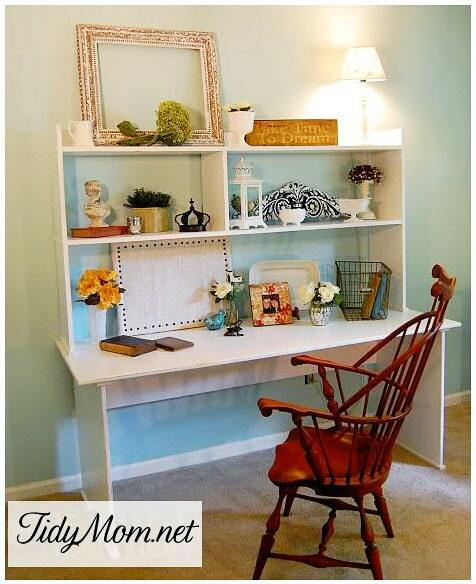 Problem was, I couldn’t keep the desk like this (picture above). The Bug Man has his own pest control business, hence the nick name. 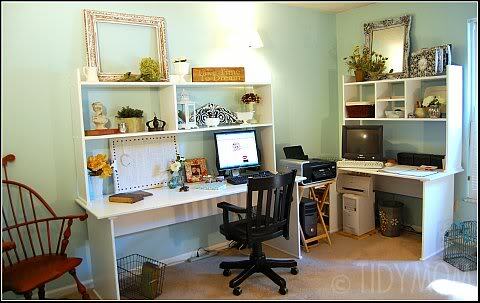 So this office needs to be set up for his business needs as well as my blogging. I still don’t have anything on the walls, but here’s how it looks with the computers moved in. The computer on the right is ancient, but I do all of his company bookkeeping on it, with old programs that can’t be moved over to the newer computer – so some day, when I splurge on a new program, I can eliminate that old computer. I’m also on the lookout for a small table to put my new Lexmark wireless printer on, instead of the little folding table. From this angle, you can see I still need to do something with the window – I’m thinking maybe burlap drapes?! I want to paint that little birdhouse sitting on the floor – maybe red? 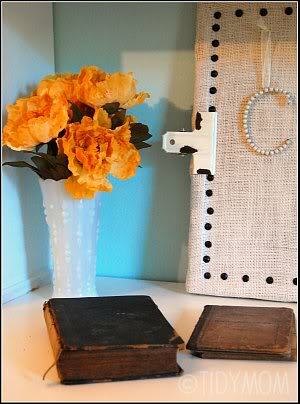 Fill the bookcase with goodies and supplies, I’d like to add a wreath or something to the closet door. 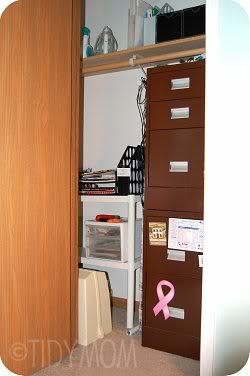 Take a look inside the closet (no I didn’t bother to paint the inside of the door) – I was able to put all of my ugly office supplies, file cabinets etc inside behind closed doors!! I was SO excited they fit!! 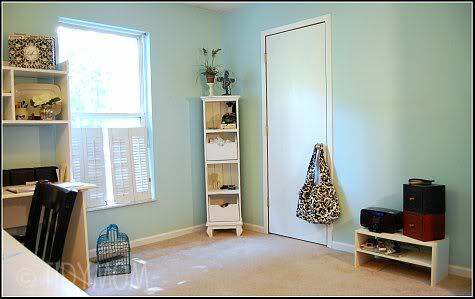 On this blank wall, I would like to find a great hutch. Not sure what color I will paint it yet, I’d like to do something other than white. I’m going to try some red accents, but I think a red hutch might be a bit too much – maybe yellow? I’m also going to Modge Podge all of the switch plate covers as soon as I find the perfect paper. Here are some of the goodies I have collected for the space. 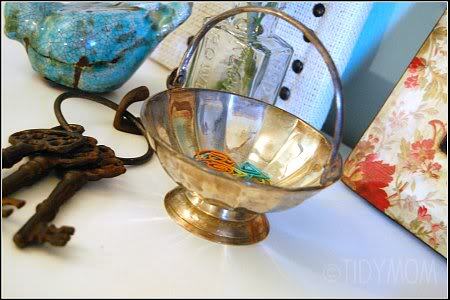 Most of it I have purchased at Good Will, resale shops or garage sales. This lantern was new from KMart, the little bird nest inside was from a fellow blogger Valarie. 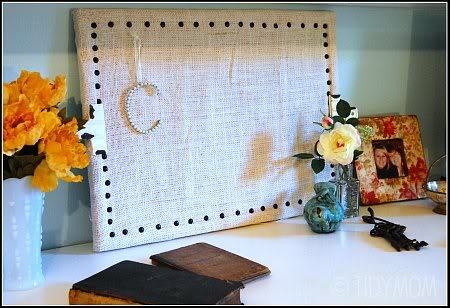 See how I made the burlap bulletin board, and you can about how I made the cheap wall art with the picture frame. The glass bottle with flowers were in clearance at Michaels. If you have any suggestions, I’d LOVE to hear them!! wow! I wish I had an office! That is great! I hope you can be very creative there. It's simply a great space. Even with the computers all moved in, you managed to make it look cute AND functional. 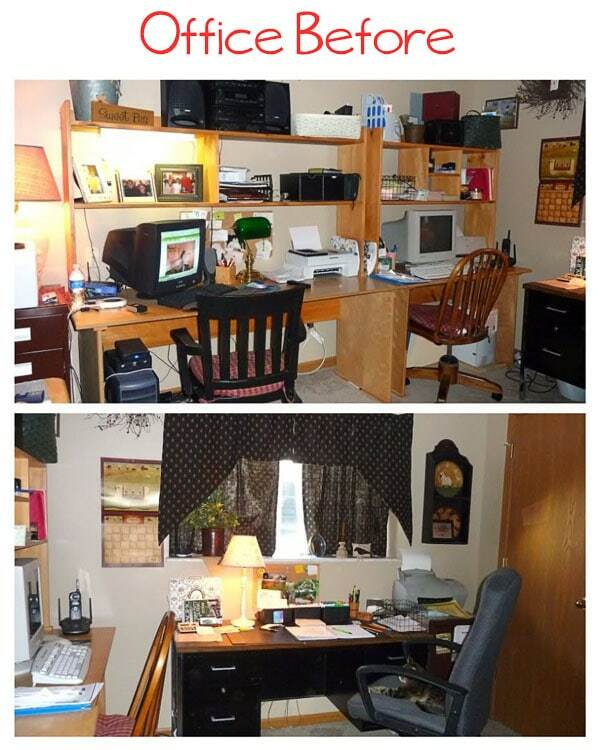 It was great that you could hide all the office "clutter" in the closet. I'd love that birdhouse painted red, and maybe stuck on top of that tall shelf in the corner? What a great space … how about a roman blind in burlap on the window? As for the hutch (or maybe a bookcase? 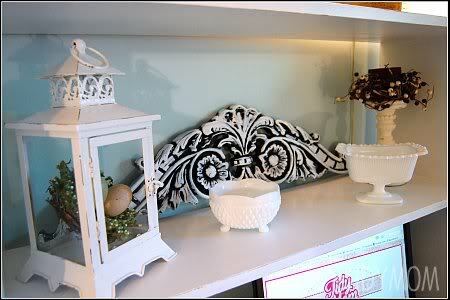 ), I'd stick with white for the furniture, with perhaps a black and white paper or fabric lining the back of the shelves? It looks great! Love that color! Dropping by from The Nester's place. SUPER TRANSFORMATION. 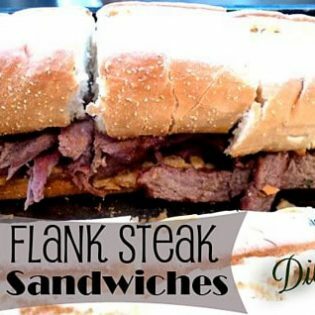 love the colors – too! 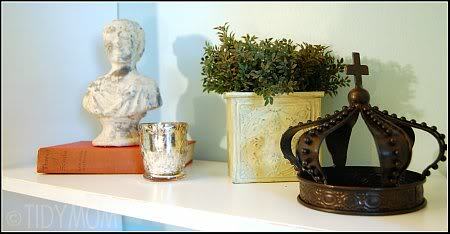 the open shelving is so neat & "tidy". i think seperating the 2 desks made a huge impact on the space, just my opinion. 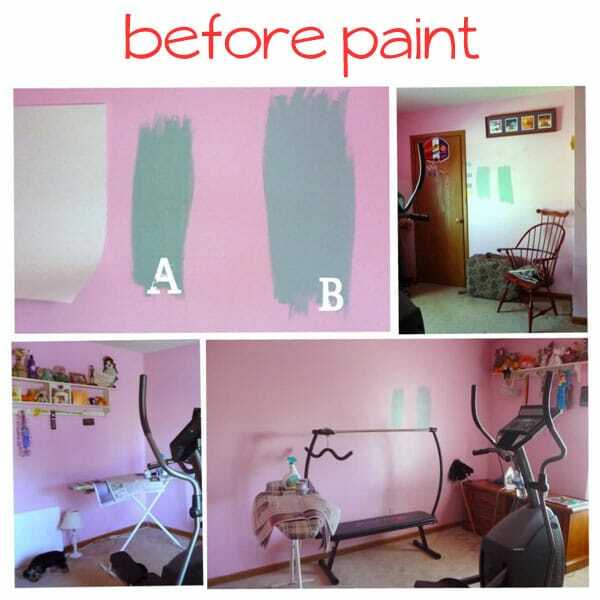 I love the look of your room!! THANKS! I am book marking this page for inspiration. wow I love your office space. You have great ideas. I always have such a hard time being creative sometime.